Which comes first—reading or writing? For many little kids, writing comes first. Not writing words but writing pictures to tell stories. I was with a four-year-old recently, and listened as he explained his drawing on a white board in his house. On the left were three smiling stick figures—a tall one who was waving, a medium-sized one with long hair, and a short one. “That’s my dad, that’s my mom, and that’s me,” he said. Next was what looked like a rocket ship in motion. “We are flying,” he explained. Farther along in the drawing was a circular object. “That’s the moon,” he said. “Are you going to the moon?” I asked. This story’s ideas came from the child’s head—he will be traveling to Brazil soon with his mother—but also from the many books his parents have read to him (and the many cartoons he has watched). From those sources he has unconsciously learned that stories are written in English from left to right; that they have a beginning, middle and end; that they are told in chronological order; and that they contain characters who do something. This child can write his name. He knows the alphabet in English and in Portuguese. He can read some sight words in English. But he cannot write a story in words. Yet he can write a story in pictures, incorporating many of the fundamental aspects of story-telling. So which comes first—reading or writing? “Scaffolding” is an educator term to describe teacher actions to help students learn something new. Scaffolding could be a series of questions meant to prepare students for what they are to read. Scaffolding could be a timeline of a topic—say American history—to show where a subtopic—say the Civil War—fits into the big picture. Scaffolding can also be simple diagrams to help visual learners, ESL students and students with comprehension issues understand what they are about to read or write. These diagrams help students “see” the organization of a reading passage, or they help students “see” the structure of a paragraph or essay they are about to write, providing clarity. For example, suppose a student needs to read a biography of Coretta Scott King. To help the student see the organization of Mrs. King’s life, the teacher could draw a color-coded diagram of important activities in Mrs. King’s life. Take a look. This diagram is a simple visual pattern following Mrs. King’s life, more or less in chronological order. With a little help, the student might see that Mrs. King’s life was private until she married; then her life became public as she worked with her husband on civil rights matters; then her life became even more public after his death as she led efforts to honor him and she spoke and wrote about ongoing civil rights matters. 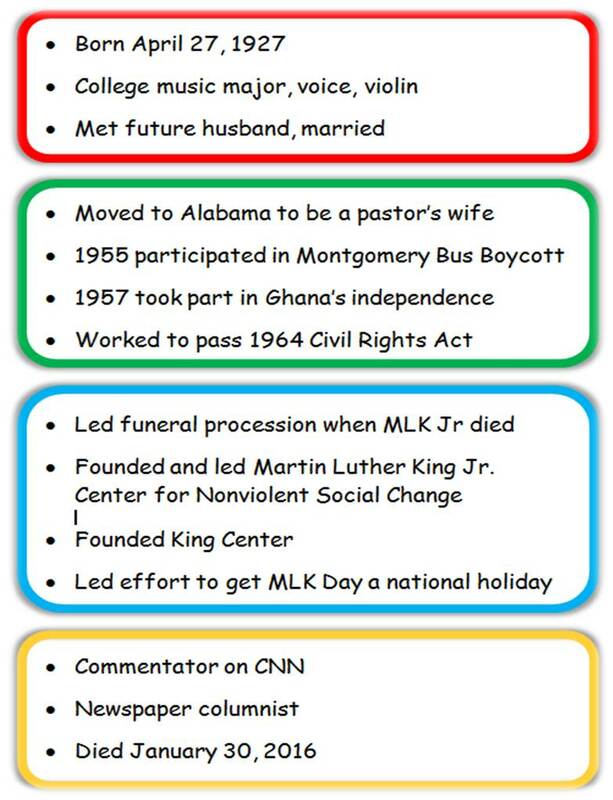 If each box of the diagram is outlined in a color which corresponds to a portion of Mrs. King’s life or activities, the overall organization of the essay becomes clear. Color-coding the information is important because it helps visual learners “see” how the reading passage breaks down into smaller chunks. Whether it is Junie B. Jones’ fear of school buses or why polar bears face a bleak future, a diagram showing students what they will read before they read it allows them to see the big picture and each subtopic in the order in which they will read about it. For children learning English or children with reading comprehension problems, a diagram can help them understand and remember what they read. What’s the right age to read Harry Potter? Harry Potter turns 31 tomorrow, July 31, a good time to ask if there is a right age for children to read the Harry Potter books. When the books were first published, Harry was 11, and The Sorcerer’s Stone was more fantasy and magic—owls who delivered mail, a sorting hat, photos who talked—than menacing evil. No need for concern. But later books focused on evil and Harry’s fight to conquer it. Much tougher reading. The first book came out in 1997; the second in 1998; the third in 1999; the fourth in 2000; the fifth in 2003; the sixth in 2005; and the seventh in 2007. Kids who read the first book when they were eight couldn’t read the fifth book until they were 18 and, presumably, mature enough to handle its content. But today, voracious eight year olds can devour the series in a month or two. Should they? Here are some suggestions to consider if you have a child coming of age to read Harry Potter. Harry turns 11. Kids usually like to read about child characters who are slightly older than they are, so readers 8, 9, 10, and 11 years old (usually, third, fourth and fifth graders) might enjoy the first book. However, a child’s reading level needs to be considered. Some third graders are just starting chapter books while others have been reading chapter books since kindergarten. Lagging readers might miss out on much of the meaning in Harry Potter books because of a lack of vocabulary or difficulty with inferences. For them it might be better to wait. Precocious readers, on the other hand, might be able to handle the first Harry Potter book with ease. Two scary parts (a troll fight and a final fight between Harry and Voldemort) are a little scary, but not scarier than what children have been exposed to in the evening news or in video games. They will miss some of the cultural differences between British writing and American writing (such as a cupboard in London being a closet in the US) but they will still understand what is important. A child’s emotional resilience needs to be evaluated too. If children suffer nightmares from TV shows or scary picture books, Harry Potter novels might not be a good choice until the children are older. Or you could tell them when they start the first book that by the end of the last book Voldemort is dead and Harry is alive. But that takes some of the suspense from the reading. If a child can read book one, that child is ready for book two. It has another fight scene at the end, but in other ways The Chamber of Secrets is a fanciful children’s story like book one. Ditto for books one and two except that the concept of a serial killer is introduced. This concept foreshadows events in a later book. Two minor characters die in this book right in front of the reader’s eyes. Also, children learn that some people cannot be trusted when one such person tries to lure Harry away. The tone of this book is darker than the previous three, and for that reason precocious first and second graders probably shouldn’t read it, and sensitive third and fourth graders might not be emotionally ready. As a parent, you should be prepared to discuss the themes of death and trustworthiness with your children before you let them read book four. I recommend waiting until fifth grade or middle school for this book. Someone Harry loves dies in this book. Its tone is about the same as book four, that is, darker than in the first three books. Harry is 15, indicating that readers should probably be almost that age too. Postpone this book until middle grades for most children. Book six is too tough for elementary school children and even for some middle grades children. Harry, 16, must take on enormous responsibilities and he has no one to protect him. No place is safe. Another scary idea is that people exist who murder for the heck of it—not for a rational reason but just because. At the end of the book a pivotal character dies a terrible death at the hands of another pivotal character. Harry vows to avenge his friend’s death. More deaths occur, but none so chilling as at the end of book six. A reader who can stomach book six can stomach book seven. Read during late middle grades or high school. A few students in my class read quickly. What do I do to keep them on task? You could prepare a quiz ahead of time on the reading selection. Let the quiz focus on the pages to be read. Ask students to raise their hands when their reading is done, give them the quiz and watch. Since the quick readers are often gifted students, ask questions not at the knowledge level, but at higher level thinking. Ask inference questions too which everyone finds tough. Ask students to write not only the answer but the page and paragraph or line number which proves their answers. Collect and check the quizzes to know if the quick readers are skimming or truly gaining knowledge. You could ask quick readers to outline the reading passage. If it is nonfiction, then the outline could name the way information is presented, such as chronological, problem and solution, cause and effect, or whatever is appropriate. Then the students could write one sentence per paragraph describing the information in each paragraph. If the reading selection is fiction, then the outline could state the type of writing, such as description, dialog, action, or whatever is appropriate. Writing one sentence per paragraph might not work for fiction, but one sentence per scene or character might. The point is for the students to prove to you that they comprehend what they have read. You could ask students to choose five words from the passage that they don’t understand or that they think their classmates might not understand and use a classroom dictionary to look them up. Then students should write each word in sentences to show what the word means. You could ask students to write one (or two or more) questions about the reading which require thoughtfulness to answer. Collect them, shuffle them, and then use them for class discussion or homework. Notice that all of these assignments focus on the original reading selection and either extend or deepen students’ understanding of it. Students need only paper and pen and possibly a dictionary to do the work. If you have the extra assignments printed up to use as needed, you can pass the appropriate one out any time a student finishes early. And most of the ideas work well in science and social studies classes as well as in ELA classes. Of course you could always have early finishers take out books and read them. If the books’ Lexile numbers fit the students’ reading levels, this works. But it does not enrich the reading lesson, and it could cause resentment among the slower readers who might feel punished for their slower progress.